Good morning! How goes the week? We're closing in on the weekend! I've had a couple of days at home and I've spent them catching up on stuff I can't show and then having some fun with sewing. As you can see I got my little bag done. My last scallop is cut off .. well it's there, under the bag. I just couldn't make that little 1 inch box corner, so mine is a little bigger, and that left a bit of those scallops under the bag. I'm cool with it, for the most part. 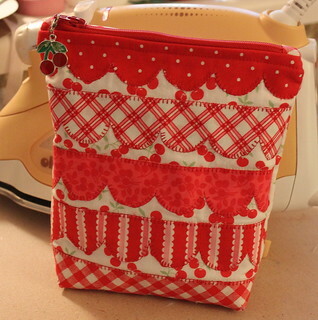 Its a fun bag to make, and I'm glad that Camille made it into a pattern. This month in the Sew Sweet Bee it's Heather's turn to request a block. She chose a pinwheel, it's a great block to make. 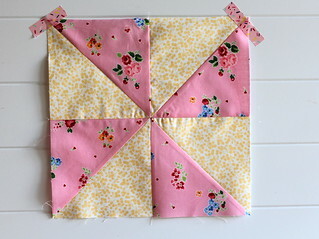 I like to machine baste my pinwheel in the center before I sew it, do you? I want those triangles to match, although as I can tell with the picture, that one in the lower left might be off a smidge. I also don't press my seams open, so that makes it harder to get a nice flat block like I see so many places. I started quilting back when most of the quilting was still by hand, so we pressed to the side so you could hand stitch along the seam without the bulk, and also so that you seam wouldn't split if you sat on your quilt. No pressure just on the thread. Now I notice more and more people pressing seams open everywhere, I'm not sure how I feel about it. I mean sure, sometimes it does make sense when you have a lot of bulk. Anyway, these are the kinds of things I think about sometimes. I always enjoy seeing your projects! Just before 5:30 this morning tornado sirens woke us up. That'll get your heart racing! It apparently touched down to the east of us. It's still storming here. Rain. Rain. Rain. Boo. Hiss. So cute Pam!! I haven't sew in weeks ;- ( but packed up for vacation and tucked in a big bag full of hexies for long flights and downloaded a couple of seasons of Sherlock so I am set! Love your little back PKM! I'm not a fan of ironing the seams open -- guess I'm just old school. I just don't think it's as good for wear and tear on the quilt and I always wonder how ironing them open in the first place got started. Sometimes, Grandma just knows best LOL.